In order to install Linux, you must first download an ISO image, which is a single file containing everything necessary to boot and install the operating system. These images are also often a point of confusion for new Linux users, as you cannot simply copy the file (ending in .iso) to a USB flash drive and boot into the new operating system. Instead, what you must do is burn the image to the drive so that it is bootable. How do you do that? With the help of one of many user-friendly tools. One such tool is called Unetbootin. Unetbootin is available for Windows, macOS, and Linux. The application makes the process of burning an ISO image to a USB drive incredibly simple. 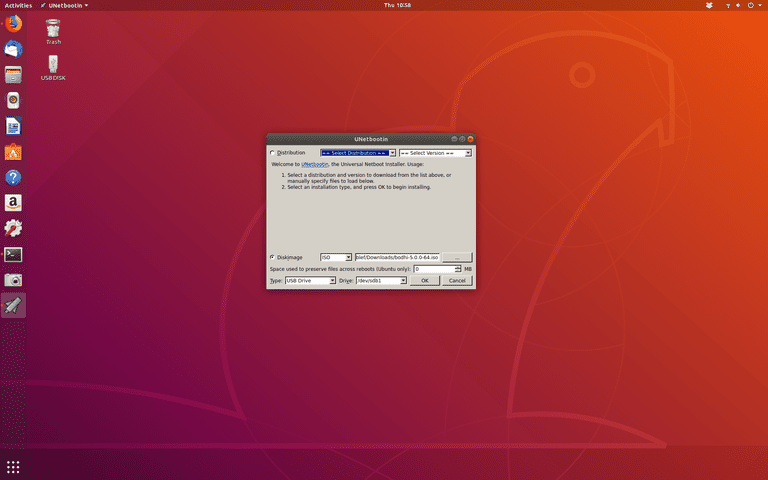 For the purpose of this article, we’ll be using Unetbootin on Pop!_OS (which is a version of Linux created by System76). The steps for using Unetbootin are similar, regardless of what platform you use. To make this happen, you’ll need a USB flash drive with at least 8GB of free space, an ISO image of the distribution you want to install, and a desktop or laptop to install on. The first thing to do is download the ISO image of the Linux distribution you want to try. To do this, head to the website of the distribution in question and download the necessary file. Say, for instance, you want to download Ubuntu Linux. Point your browser to the Ubuntu Desktop download page and download the image file (which will end in .iso). These images can be fairly large in size (up to 4GB), but are typically under 1GB. The Unetbootin app doesn’t actually install. Instead, it’s a executable file, which means you only have to download the file and run it. How you run it will depend on what platform you use. For example, if you use Windows or macOS, you only need to double-click on the downloaded file to use Unetbootin. From the Unetbootin window, click the radio button for Diskimage and click the file button (three horizontal dots). Locate the downloaded ISO file, select it, and click Open. Insert your USB drive into the computer in which you are running Unetbootin. From the Type drop-down, select USB Drive and From the Drive drop-down, select the USB drive you just inserted. Click OK and, when prompted, click Exit. At this point, depending on the speed of your computer and the size of the distribution you’ve downloaded, Unetbootin will take some time to burn the ISO image to the USB drive. When it completes, you can then close Unetbootin, remove the USB drive from your computer, insert the USB drive into the machine you wish you to install Linux, boot the machine, and being the installation process. In order to successfully boot from the USB drive, you must know how to access your computer’s Boot Menu. How you do this will depend upon the computer you are using. You can find out by googling your computer make and model and “boot menu”. For instance, if you have a System76 Thelio, you’d good the phrase “how to access the System76 Thelio boot menu”.